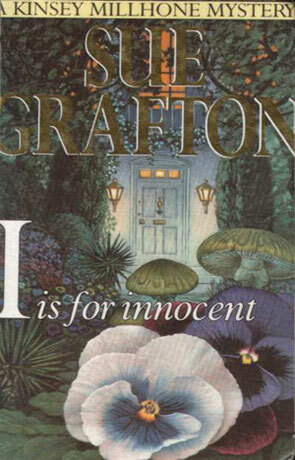 I is for Innocent is a mystery novel by Sue Grafton. It has been a while since I last read a mystery, but once in a while the craving for something 'normal' and now based rears its ugly head. Mystery fills this role quite nicely. I've read the first Kinsey Millhone mysteries (from 'A is for Alibi' to 'H is for Homicide'), but it has been a while (I think that it was around 1991). I've kind of feared going back to Grafton - what if I found that the books that had kept me up late many a summer night, years ago, were really quite trite and banal? Add to this that I'm not normally much for series, but they do have their good sides, when it comes to mysteries, where the characters, their motive and opportunities should be the foremost thing instead of universe and background building. For those of you that don't know, her Kinsey Millhone is a private investigator, working in a small town 95 miles north of Los Angeles, she's young (I'm not sure of her age, but I would say early thirties, which is young compared to other famous fictional detectives – definitely younger that Miss Marple), she's single and not that hip. She doesn't carry a bit gun, she doesn't have a fancy car and she cleans house when she's in trouble. What she does have is a tendency not to take anything at face value and to ask "annoying" questions. It has been six years since somebody killed Isabelle Barney by shooting through the peephole in her front door. Her ex-husband was taken to criminal court and acquitted, but now her ex-ex-husband is trying to get the ex-husband tried at civil court. It's Kinsey's job to find evidence to support the case – only problem is that all the evidence she finds strongly points to Isabelle's ex-husband. It may be the truth, but it's not the best way to start in a new job. Not exciting in the I'll-have-to-finish-this-before-I-can-sleep kind of way, but good fun that will keep you guessing to the end. Also contains one of the best (as in short and precise) descriptions of a filthy bachelor bathroom. I'm unsure as to how many Kinsey Millhone books there are, but this one is from 1992 and amazon.com has an O is for Outlaw. I'll be back to Grafton the next time I feel the need for a PI mystery. Written on 1st July 2000 by TC.